In our last Student Spotlight of the 2017-2018 academic year, Sabrina Jones shares her experiences as a Golden Bear Orientation mentor and a CNR Peer Advising Leader, and offers advice for incoming CNR students. Sabrina Jones at Sonic Runway, an art installation in San Jose. Now in its second year, Golden Bear Orientation (GBO) is UC Berkeley’s new campus-wide program for incoming first-year and transfer students. What can students expect when they arrive on campus for orientation? A week of 18-hour days full of activities. A silent disco party. Diversity and inclusion discussions. Walking miles around Berkeley. What’s it like to be an orientation leader at GBO? 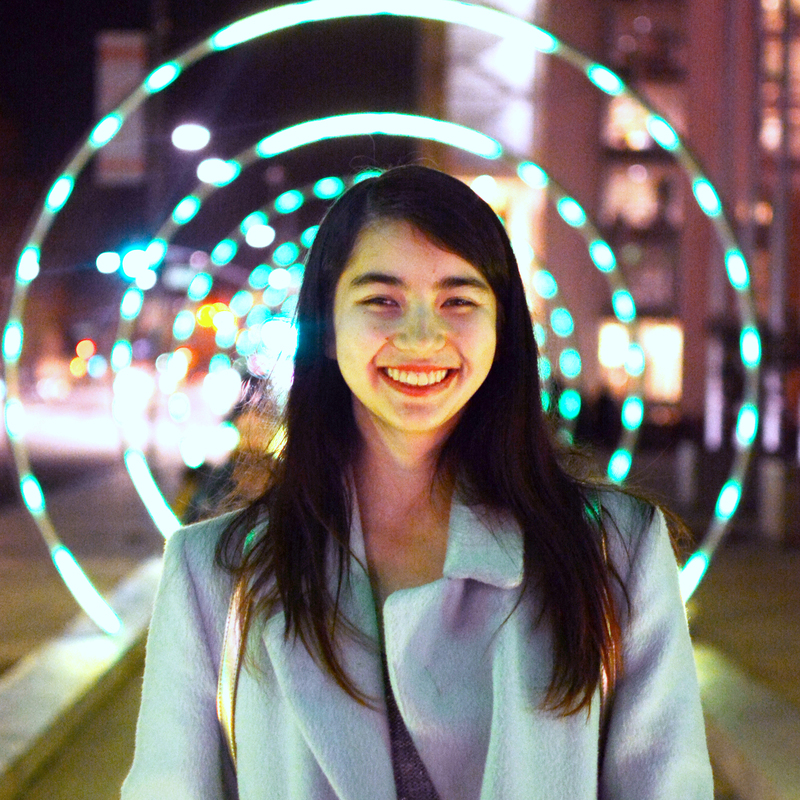 Being a GBO leader and mentor was an incredible amount of work—and an incredible experience. Before orientation started, all GBO leaders attended several 3-hour training sessions. GBO itself was a week of waking up early to attend 7:00 am GBO leader meetings before leading incoming first-year students around campus, traveling as far as San Francisco on field trips, and coordinating activities late into the night—sometimes as late as 1:00 am! Our week was packed with challenging discussions about diversity, inclusion, safety, sexual violence, identity, mental health, and many other topics. This was overwhelming for some students who had never engaged deeply with these issues. However, I did find this exposure beneficial and important as UC Berkeley cares deeply about improving the campus and community in these areas. 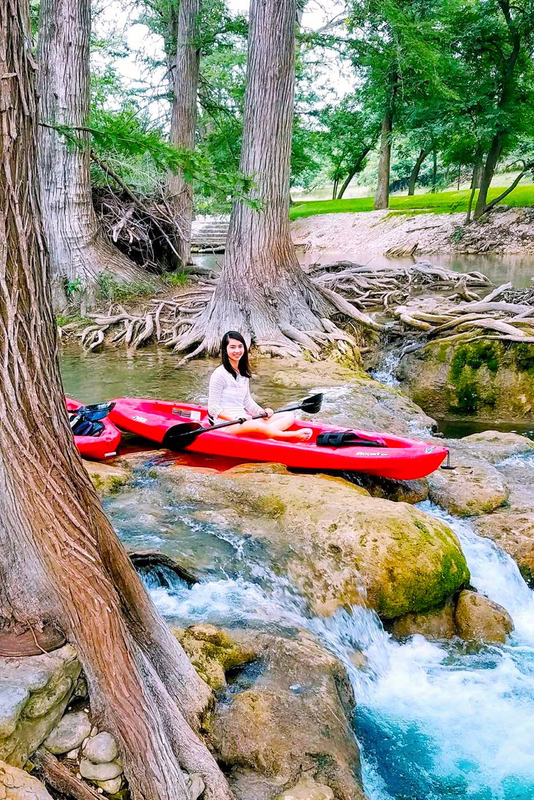 Kayaking on the Medina River in Texas. Despite the tiring hours, we also had a lot of fun playing card games, learning the embarrassing “Common Bond Dance,” going on hikes, singing off-key karaoke, dancing at the silent disco, and breaking a Guinness World Record—the list goes on and on. I truly enjoyed welcoming first-year students to campus and becoming friends with many of them. As a recovering introvert, it definitely took me out of my comfort zone having to speak loudly and authoritatively while managing the concerns of 30-plus students at a time. It was new for me to be the one striking up conversations and encouraging others to also interact with people who they might not normally see as potential friends. I believe this was worth it as my efforts, along with those of my partner GBO leader, strongly promoted inclusivity, and the friendliness of our orientation group created a genuinely welcoming environment that has held many of these freshmen together as close friends throughout their first year. The entire GBO experience helped me grow both as a leader and as a person. What is the Peer Advising Leaders (PAL) program and why did you want to become a PAL? Peer Advising Leaders are students who serve as a front line for the advising office. We answer students’ questions about classes, scheduling, majors, CNR organizations, research opportunities, career options, and many other areas. In general, we strive to help in any way we can. We also work with advisors to come up with fun programming and event ideas for CNR students. I wanted to become a PAL for many reasons. I hoped to improve my communication skills by helping students navigate CNR’s resources and opportunities. I knew I would also benefit from working closely with advisors as well as gaining a deeper knowledge and understanding of CNR’s policies. Finally, I was excited to foster friendships with my fellow PALs. Sabrina (far right) with her fellow CNR Peer Advising Leaders. What's your favorite part of being a PAL? For many CNR students, 260 Mulford Hall—the home of the advising office—is one of the most welcoming places on campus. The couches are perfect for napping without shame, and the “positivity wall” fills you with good vibes. Every time I look at the wall, I find a new interesting quote or phrase that gives me a chuckle and brightens my day. I feel very lucky that I spend so much time in 260 Mulford as a PAL. My favorite part of being a PAL is becoming friends with the people who come up to the PAL desk while I’m working. One of my goals every semester is to make at least one friend in each lecture, discussion, and lab that I take, and I have been successful in that endeavor partially because of all the CNR students I interact with as a PAL. Why does studying molecular environmental biology interest you? With the molecular environmental biology major, I have the opportunity to explore diverse but connected areas of the natural world in an in-depth and thoughtful way. In genetics, it’s fascinating to learn that everything—even something as seemingly insignificant as the fruitfly Drosophila melanogaster—is composed of a complex and precise genetic structure and is valuable for understanding how it fits into our world and its ecosystem. Widening the scope to the environment and looking through many different lenses from ecological and policy perspectives has helped me become more conscious of the consequences of my actions and more appreciative of nature. Growing up, I spent a lot of time indoors studying. Taking classes at UC Berkeley has helped me realize the tiny joy that can be found in simply being outside, appreciating all the unique creations of life. Being able to identify plant species is so exciting to me! 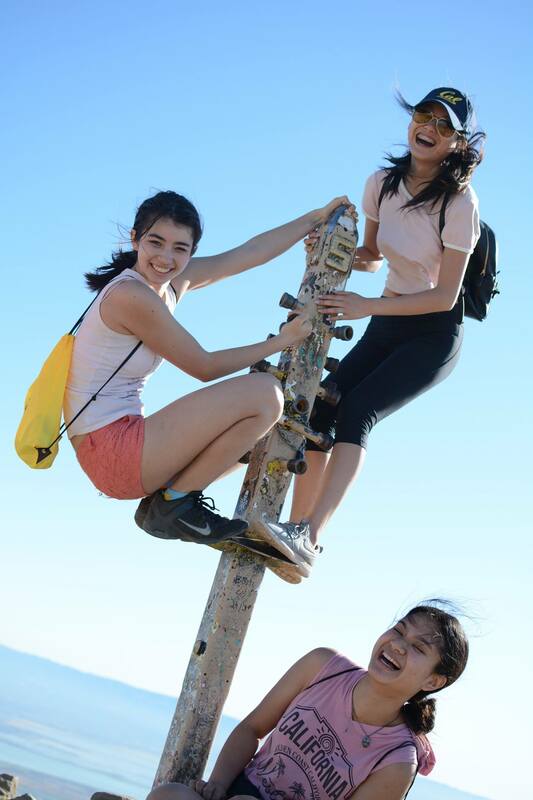 Sabrina (left) on a hike to Mission Peak with two friends. As a PAL and GBO leader, what advice to you have for newly admitted CNR students? Try new things, take risks, and embrace failure. Cal is unbelievably challenging. It is impossible to avoid adversity on this campus, and it exists in different forms for each individual. However, we are all incredibly privileged to be here. Berkeley is the dream school for so many bright students worldwide, and we are the few lucky enough to attend. On a large campus with so many talented individuals, it’s hard not to compare yourself to other students and think that others are getting better grades, participating in more impressive activities, maintaining a more active social life, accomplishing bigger achievements—and more. But you are here to be you. You are here to strive to become the best version of yourself. When you think about the worst that could happen if you truly fail, it indeed might be bad but not to the point that you cannot pick yourself up and try better next time. You are about to become a Golden Bear. Gold can get dings and scratches, but it never loses its ability to shine. You will shine!"